Though the sense of freedom on the open road is what draws so many of us to motorcycles, it is important to understand and follow California motorcycle laws. Responsible riding can help you avoid traffic citations and fines, but more importantly, seriously reduce your risk of getting into a motorcycle accident. 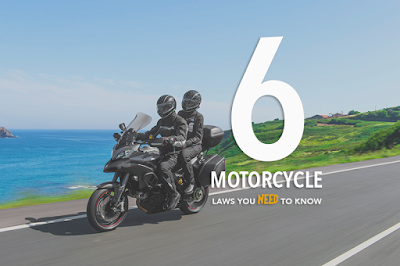 Here are six California motorcycle laws you need to know, from the Los Angeles motorcycle accident lawyers at Russ Brown Motorcycle Attorneys. Are turn signals required on motorcycles in California? According to California state law, Motorcycles are required to have proper working turn signals, front and rear. Turn signals are not required on a motorcycle built and first registered prior to Jan. 1, 1973. Are there regulations on motorcycle exhaust systems? California Gov. Arnold Schwarzenegger enacted the Motorcycle Anti-Tampering Act in 2010. The law took effect on Jan. 1, 2013 and gives police the authority to ticket motorcycles with non-compliant exhaust systems. However, the law applies only to 2013 and newer motorcycle models and exhaust systems. Older bikes equipped with aftermarket systems purchased before Jan. 1, 2013, are not affected. Is it legal to lane split on a motorcycle? Lane splitting by motorcycles is not illegal in California when “done in a safe and prudent manner”. The California Highway Patrol and other statewide traffic safety groups have long endorsed a basic guideline for motorcycle “lane-splitting.” Recently introduced legislation may place limitations on the practice. In addition, it is illegal for motorists to intentionally block or impede a motorcyclist in a way that could cause harm to the rider. What age can minors ride as motorcycle passengers? There is no specific age specified in the California Vehicle Code regarding when a minor can begin riding as a motorcycle passenger. However, the California laws require that all passengers must have a “seat securely fastened to the machine at the rear of the driver and (be) provided with footrests.” The law continues to state that “every passenger…shall keep his feet on the footrests while such vehicle is in motion.” To ensure safety and compliance with the law, some motorcyclists have had footrests moved to fit the height of their child or have purchased a special seat for children with built-in footrests. Beyond the law, it is important to educate your passengers on the fundamentals of leaning and riding as a team. How old do you have to be to drive a motorcycle in California? In order to obtain a motorcycle license in the state of California, you must be 16 years of age and have not only completed a driver’s education and training course, but also have completed a motorcycle rider training course. Even if you follow every California motorcycle law, you cannot rely on other motorists to always abide by traffic laws. If you’ve been involved in a motorcycle accident, you need to find a California motorcycle accident lawyer that can get you the settlement you deserve and will see that you are treated fairly. With a 98 percent success rate and reputation for winning difficult cases, Russ Brown Motorcycle Attorneys are the Los Angeles motorcycle accident lawyers you can trust with your case. To learn more about the services offered by Russ Brown’s motorcycle injury lawyers visit russbrown.com.